Last Saturday we created an Olympic Obstacle course (more on that coming soon) for Sweet P complete with an Olympic torch, medals and rings. We made our medals on Saturday morning while the Farmer was at class, and I was having a hard time coming up with what to use. My original idea was to just use paper and paint it Gold, Silver and Bronze, but while I was in the basement rummaging through the recycling products I keep for crafts, I found a gold lid from a jar of pickles. It was PERFECT for the gold medal. So I decided we'd use that for gold and paint the others. Then I picked up a plastic lid the same size as the gold lid and thought YES! we can cover this one with tin foil! There were two of those so I decided we'd use tin foil on one and paint bronze on a piece of paper for the bronze medal. After Sweet P'd painted a bronze circle on a piece of paper and it was outside drying, she made the silver medal with tin foil. When I looked it I realized we could simply PAINT the tin foil with the bronze paint and it'd be perfect! I mixed up another batch of bronze paint and she painted the tin foil (not as easy as it looks!). She ended up having to do a bit of a sponge method to get the paint to stay without smearing. Fold tin foil around the 2 plastic lids until fit to your liking. Set aside the Silver medal and paint the other with bronze paint. Set aside to dry. Hot glue beads to the inside groove of each lid. Wear with pride! 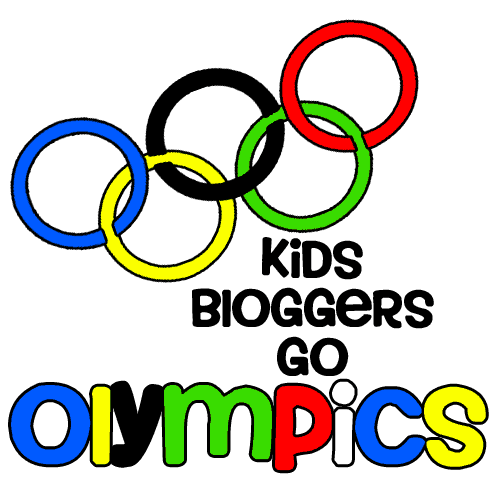 Check out our 3 Olympic Ring Ideas and stayed tuned for Kids Bloggers Go Olympics! The Blog Hop beings July 27th! We hope you'll join the fun! Visit these introduction posts by Rainy Day Mum and Angelique Felix for more information on how YOU can participate!